As an organisation, as far as we know, we are the only team here reporting exclusively on Christian athletes and with the aim of sharing stories of hope and faith around the world. What an opportunity we have and we are so thankful to be here on the ground, where the action is. Already in these pre-game times, our days have been long, with early starts to shuttle down to the Gold Coast and then late returns after each day's activity. We have achieved so much already, we have filmed features with a local lawn bowls club, alongside Team England in their training. We've interviewed Aussie Swimmer Daniel Smith on his amazing testimony of faith and we've spoken to fans and tourists about their hopes and predictions for what's to come. Our Gold Coast education started straight away as we were taken to see our very first AFL (Australian Football league) match, to Brits that would be 'Aussie rules football'. Hosted at the Gabba cricket ground, the home of the Brisbane Lions, we watched a sport that can be described as manic and confusing, thrown together with a fast-paced, highly-skilled sport at it's core. Spectating in a stadium that can hold 42,000 was a great experience and shows the fans' undeniable passion for the game. On our public transport travels into the Gold Coast each morning, our eyes are constantly drawn to the countless places to eat and the huge range of cuisine that you can dine on out here. For our first evening meal we headed to Broadbeach which is home to the Kurrawa Surf Club, known for it's great food and idyllic location right on the beach. Tom and I sampled the Barramundi, a fish with so much flavour that we may never touch cod again! Australia and specifically the state of Queensland has so much tradition and culture, which we are trying to immerse ourselves in. We were able to witness a movement on the Gold Coast which the locals here on the ground say hasn't happened for some twenty years! 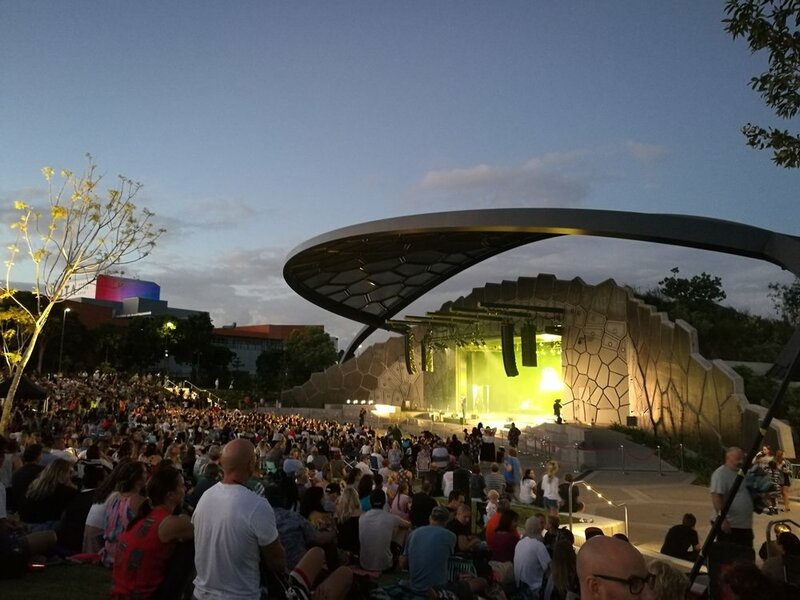 On Easter Sunday we attended the 'Easter United' church service, where over 100 local churches gathered together in a stunning outdoor venue, led by Hillsong musicians. To be a part of something huge, alongside 3000 other people, was quite something and the feeling was that this event may spark some momentum and a kick into the churches surrounding this iconic area. The Gold Coast is in overdrive and making it's final preparations to welcome nations, athletes and fans from all over the Commonwealth. There is a growing buzz each day, reflected in the increasing bodies that are starting to flood in. The atmosphere is great, festivals are dotted along the coast and everywhere you look, billboards and screens are reminding you that it's nearly time. In terms of the competition itself, we both feel that Team Australia will be strong across the board and may well be powered up a level by the home crowds. Team Canada and South Africa also look strong, so it will be great to see how our very own Team England fairs. We are hopeful of English success but more sure that these games will create some awesome sporting memories!